One of the regular features of my childhood were my grandmother’s slide shows. She retired in the 1970s and started traveling around the globe, often sending me postcards along the way and keepsake Christmas ornaments on the holiday. When family gathered at her house in Santa Cruz, California we would be treated to a meal featuring traditional dishes of, say, Morocco and then sit back and hear her narrate slides, Kodak projector fan whirring in the background. Slide shows are something most of us are familiar with and the organizing metaphor translates well onto the computer. Maybe too well. Nora Paul and Laura Ruel published an article titled “Navigating slide shows: What do people choose when every choice is possible?” in June’s issue of the Online Journalism Review (Annenberg School of Journalism, University of Southern California). The two authors conducted a eye-tracking study to determine how 34 people viewed an online, interactive slide show produced by washingtonpost.com. 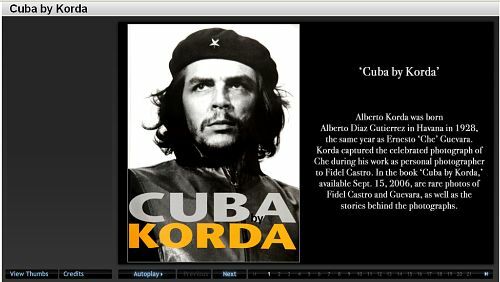 The Cuba by Korda slide show interface is quite complicated yet retaining a certain simplicity. There are Next and Previous buttons, an autoplay option, and methods to both skip ahead to Slide X by a numerical listing at the bottom of the slide show and a link to View Thumb(nails) as a contact sheet. It turns out the majority of readers, even when given all these options, still view the slide show in it’s original narrative form by repeatedly pressing the Next button. Those same people viewed twice as many of the slides before bailing-out than those using the numbers to jump around (the time spent was equivalent). Perhaps random access by number is good for people who have scare time, especially since they end up getting sucked in to the slides that matter more to them? But that brings up an interesting subthread: fully 1/3rd of all viewers switched back and forth between the several interface modes. They might have started pressing Next, and kept proceeding that way, but at some part started jumping around via the slide numbers. Or I can imagine someone sharing the show with a friend over email with a note to check out Slide 8 (and skip the rest). Having the numerical slide listing facilitates access into that linear timeline. But most of us just want to click Next. This entry was posted on Tuesday, November 13th, 2007 at 1:14 am	and is filed under Design, Interactive, Promote. You can follow any responses to this entry through the RSS 2.0 feed. Both comments and pings are currently closed.